If you like my Broccoli Cheddar Soup, and you like my Roasted Cauliflower Soup, then you have GOT to try my new Cheesy Vegan Broccoli Cauliflower Soup! It’s so simple, but so TASTY! And it can easily be made either on the stove or in your Instant Pot. I was just getting started to make my Roasted Cauliflower Soup for my wife (comfort food for the flu) when I realized I had NO fresh onions and NO pre-packaged Veggie Broth! In situations like this, it’s either find some last minute substitutions and make-do….. or make the trip back to the store. So I found some dehydrated onions in the back of my pantry, and also a little jar of Better than Boullion – and the next thing you know I was making one of the best soups I’ve ever tasted. What I love the most about this recipe is how simple the ingredients are. This is exactly what eating a WHOLE food, plant-based diet is all about. REAL foods, without all the chemicals or preservatives. And whether you make this on your stove or in your Instant Pot, it comes together so quickly you can have a healthy dinner ready in minutes. Throw all the kids into the pool, cook until tender, and blend. Bam. Fast, simple, and tasty. Oh and I think I mentioned healthy too. So come on, let me show you how easy it is. Let’s make some SOUP! First, let’s prepare our veggies. Remove the leaves and stem of your head of cauliflower, cut it into equal-sized florets and rinse thoroughly. Also, scrub 1 medium Potato and 1 large Carrot. I left the skins on and just roughly chopped them into equal-sized pieces as well. Set the veggies aside for now. Now saute ½ cup of diced onion, either in your soup pan or Instant Pot, using the SAUTE feature. When the onion turns translucent, add 2 cloves of minced garlic and continue cooking and stirring until fragrant, about 30 seconds. Note: 2 heaping Tablespoons of Dehydrated Onions and 3 Tablespoons of hot water will equal about ½ cup fresh onion. Add 4 cups of Vegetable Broth and 1 cup of Water to your soup pan. Note: As I mentioned above, I used Better Than Bouillon and mixed 1 tsp of bouillon per cup of hot water. Add your veggies and cover. If using your Instant Pot: Set it to MANUAL mode, High Pressure, and 6 MINUTES. For the stovetop, you can either steam the veggies using a basket or colander – or gently braise them using just the liquid we added. Just be sure to cover the pan and cook until everythng is tender. Once the veggies are tender we want to blend them. If you are using an IP – carefully do a Quick Release to release the pressure and remove the lid. We want to do 2 things here…… blend the veggies and add some spices. If you have an Immersion Stick Blender….it’s easy. Just add the spices and blend. 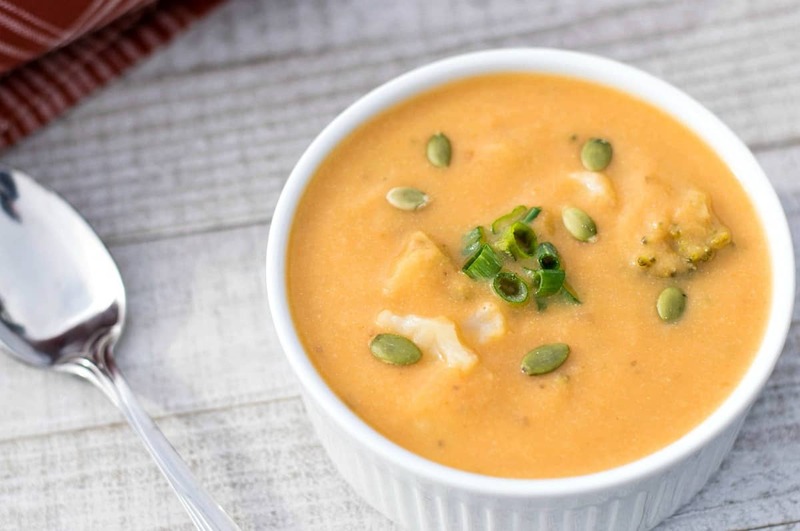 If you are using a blender, carefully blend the contents of your soup pot (in batches if need be), and on the last batch add the spices and blend. Add back to a pot and stir to mix well. The spices are ¼ cup nutritional yeast, 2 Tbs Lemon Juice, 1 tsp Apple Cider Vinegar, ½ tsp Onion Powder, ½ tsp Garlic Powder, ½ tsp Yellow Mustard, and a pinch of Tumeric. 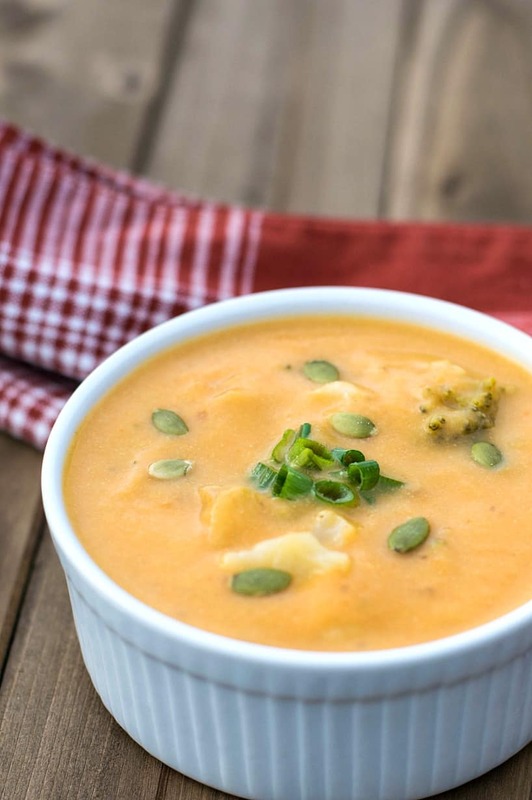 You should now have a smooth, creamy soup. To bump it up just a notch and to add a little texture….. I added 2 small bags of Steamfresh Frozen Veggies. A bag of frozen Broccoli, and a bag of Broccoli/Cauliflower mix. You can either microwave the veggies first in the bag and then add them to the soup, or just add the frozen veggies directly to the soup and continue heating until they are cooked through. 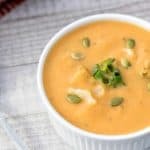 The entire head of cauliflower along with the potato, carrot, and cheese spices makes this a rich, creamy, flavorful soup. Feel free to dress it up any way you like and be sure and leave those comments below. A creamy Cauliflower Soup with chunks of Broccoli and Cauliflower swimming in a cauliflower-based Vegan Cheese Sauce. Super delicious and super healthy! Remove leaves and stem from Cauliflower. Cut into equal-sized florets and rinse thoroughly. Scrub Potato and Carrot and cut into equal-sized pieces. Set veggie aside for now. Use SAUTE mode to saute onion until translucent, then stir in garlic. Add broth, water, and veggie. Cover and steam/braise until veggies are tender. Cook on MANUAL, High Pressure, for 6 MINUTES. Once IP is finished or veggies are tender.... add all remaining ingredients (except frozen veggies) and blend using either your blender or an Immersion Blender. Blend until smooth and creamy. Taste for any seasonings that need adjusted and then stir in frozen veggies. If you microwave the veggie first - just stir them in and serve. If cooking the frozen veggies directly in the soup, continue heating until veggies are heated through. Garnish ideas: Croutons, Pumpkin Seeds, Chopped Green Onion, or fresh Parsley. Tips are always welcome and help support this site. Thank you! Veg broth, water, anything but oil. I notice you used yellow mustard in this sauce recipe, unlike your cheese sauce that calls for brown mustard. Does this soup need the extra forward flavor of the yellow mustard? I want people to use whatever they have in their fridge. I personally can’t notice the difference between yellow and brown (most of the time). So whatever is handiest. This was very good. I haven’t done very much with nutritional yeast but I love the flavor it added. I think I followed the recipe pretty exactly except for only having onion flakes instead of the powder. The flavor was really good. I think I’d like it with some smoked paprika but I don’t feel like it even really needed any garnishes. Thanks for the recipe. I can’t wait to try others. Just made this for dinner. SO GOOD!! My kids each had a bowl as well. Even the picky one!! The best part was feeling so light and comfy after a large, comforting bowl on a cold, gusty night. It won’t take much – maybe a small clump with 8-10 florets? Hey Chuck, Doesn’t Better than Bouillon have Canola Oil in it? I know I bought a bunch of them and was surprised to see it in there. Maybe I bought the wrong one? PS: I didn’t rate the recipe because I’ve not tried it yet. I was looking through your recipes to find a soup to make and this sounded yummy! I just checked the Vegetarian version, and sure enough, it does have Soybean Oil (near the bottom – so not much used). I’ll have to remember to not recommend this in the future. Thanks. Hey Chuck, they make one wiothout oil, their organic seasoned vegetable base! I just made this and it is lovely. I used half of a sweet potato instead of a Yukon. Added a little extra nutritional yeast cause I like the “cheesiness”. Used all fresh vegetables, steamed the broccoli before adding. Also added crimini mushrooms. I’m sick so this was the perfect healthy soup for my sore throat. Thank you! Super good recipe! We bot love it! Made this soup tonight and it was GREAT. Recipe is definitely going into my regular rotation. I didn’t watch the video first and put my fresh broccoli in with the cauliflower, potato and carrot and then pureed them all together, but it was still fantastic. After watching the video I will add the steamed broccoli at the end next time for texture. Added a little white pepper, but otherwise stuck to the ingredients. Wow! This was amazingly delicious! It was such a pleasant surprise to find the recipe with Instant Pot instructions when. I came here from the YouTube video. Thank you! If I wanted to use riced cauliflower and make in IP, would I add it with the other veggie? Or do I wait until after veggies done and then add it and use sauté to heat and/or cook the cauliflower before blending. I imagine it would be over cooked if I add in beginning. Thanks for your help. Love your recipes. Added a tsp of chilli powder as well as I am addicted to chilli. This soup is just sooooo delicious. Perfect plant based nutritious meal. Well done! It was yummy, this will stay in my recipe file. Had some of my non vegan family over for dinner, everyone loved it. I followed some of the other comments and backed off on the acv and lemon juice a bit. I actually forgot the mustard, cant wait to try it with the mustard. I love mustard. cooking it now will be back with a rating, I sure smells good! Chuck, this is fantastic! We’ve got snow and this is the perfect-est comfort food for a snowy night. Good Mary’s Mini soup, too! Keep up the great work!